Recently I made jam. I love jam. Homemade jam is especially great because you can use the best possible ingredients — in the case of my latest batch, red plums and raspberries from the neighborhood green market. Jams can be made from pretty much any fruit. The key is understanding that there are fruits both high and low in pectin. Low pectin fruits will generally require the addition of a commercial pectin additive in order to set up properly. 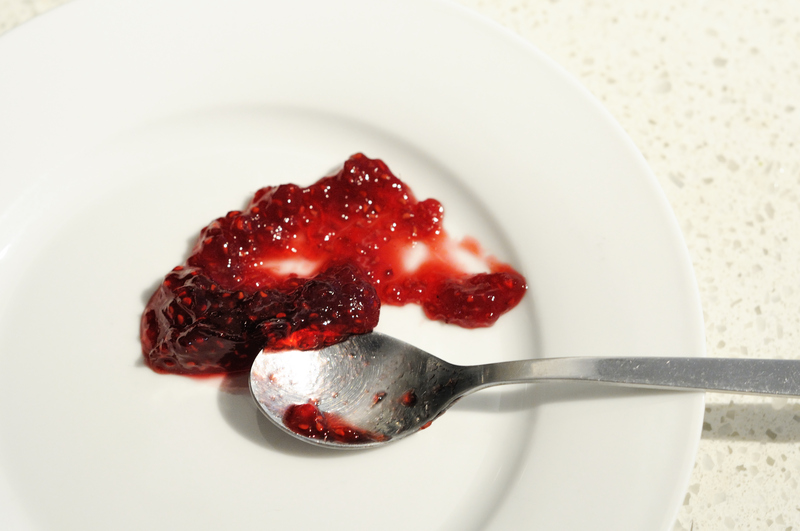 In the case of my plum-raspberry jam, I combined a fruit high in pectin (plums) with a low-pectin fruit (raspberries) to create a jam that managed to set correctly. Different fruits and tastes call for different levels of sugar. The 1:1 ratio will generally produce a very sweet jam. I tend to use my jam sparingly, so 1:1 works well for me. The sugar will not only impact the sweetness of the product, but also has an impact on how well the gel sets up. If deviating from the 1:1 ratio, some experimentation may be required. The process for making jam is pretty simple. All ingredients are boiled with a minimal amount of water in a pan until the fruit has broken down. I like to monitor the temperature of my mixture. 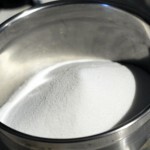 As the mixture reduces, it will become supersaturated with sugar allowing temperature far beyond that of boiling water. Once the mixture hits 220°F I pull a sample and cool it with ice water. If it forms a nice gel, it is ready to be poured into hot mason jars that have been sanitized in boiling water. From there I generally put a lid on the jar and let it cool. A vacuum will be created as the mixture cools, effectively sealing the mason jar. I generally do not further process my jams due to the high acidity and sugar content of my jams. You should always however consult the National Center for Home Food Preservation’s Guide to Home Canning which is a wonderful resource for understanding best practices to safely process and store food. 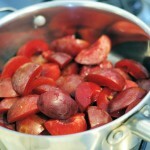 Red plums, ready to become jam. A seemingly alarming amount of sugar. 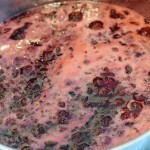 This entry was posted in Food (with Beer) and tagged fruit, jam, preservation by Nick Ladd. Bookmark the permalink.